To better prepare your home for more guests this holiday season, it’s important to clear out some space. When your home is more organized and less cluttered, it will appear instantly cleaner and can reduce allergens throughout your home. When your home, garage, and attic are free of unwanted items, it can also make your cleaning efforts go further. Once everything is cleaned up or cleared out, there will be space on the floor, shelves, and even in high places you forgot about. There will be a place for everything and everything will be in its place. One of the great things about decorating for fall and winter is that you can bring the outdoors inside. For instance, rather than purchasing all new decorations (which have to be stored away later), consider decorating with colorful leaves, pinecones, and twigs. Embrace your DIY side and create beautiful centerpieces with these outdoor elements, which can be disposed of after the holidays. You won’t have to worry about storing the Thanksgiving decorations and your family and friends can admire your gold-sprayed branches or centerpiece made of leaves from your own backyard. You can also repurpose old holiday wrapping and decorations into new decorative items, like a wreath made of bows. While you’re in the DIY spirit, take another look at everything you haven’t used in a year or more. Have extra mason jars, wine bottles, or candle holders? 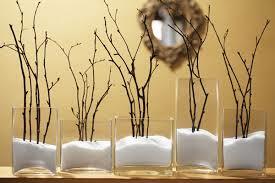 Upcycle them into DIY vases, votives, winter dioramas, or even jars of homemade preserve. Everything can be transformed into something, so get creative, visit Pinterest more often, and try recycling, donating, or gifting what you can. Invest in clear plastic containers. They can serve as the perfect containers for your storage unit, offer clear visibility of what’s inside, keep dust and bacteria out, and can be easily stacked for optimal organization. Store all your holiday decorating and gift wrapping items in a self storage unit so that they are well protected until you need them again next year. While you are cleaning out your home in preparation for guests, have three separate containers for all unwanted items around your home. Title the boxes “To Store”, “To Throw Away”, and “To Donate”. Contact your local charity to find out what they need most this holiday season. However, make sure you leave enough food in your pantry in case of a winter emergency or snow-in. After organizing and cleaning out your home, store items that have made it to your “To Store” box, as well as anything that you won’t need until spring or summer. Store summer clothes or donate items that you didn’t use all season. Once the summer and beach gear are stored away, you will have more space for snow shovels, salt, ice skates, and any other winter necessities. Contact Value Store It for more information on clearing up space and finding the right storage unit for your needs.